The design focuses primarily on a robotic system to perform tasks in which astronaut fatigue would be a problem. Enhancing astronomers’ ability to peer ever more deeply into the cosmos may hinge on developing larger space-based telescopes. A new concept in space telescope design makes use of a modular structure and an assembly robot to build an extremely large telescope in space, performing tasks in which astronaut fatigue would be a problem. so that future concept studies addressing a particular science driver can consider robotically assembled telescopes in their trade space,” the authors wrote. 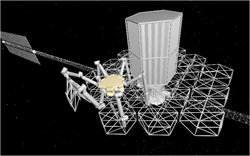 The main features of the authors’ proposed architecture include a mirror built with a modular structure, a robot to put the telescope together and provide ongoing servicing, and advanced metrology technologies to support the assembly and operation of the telescope. Mark Clampin, director of the Astrophysics Science Division at NASA Goddard Space Flight Center, is editor-in-chief of the Journal of Astronomical Telescopes, Instruments, and Systems. The journal is published in print and digitally in the SPIE Digital Library, which contains more than 430,000 articles from SPIE journals, proceedings, and books, with approximately 18,000 new research papers added each year.